R&F Property Australia is proud to announce that we will be undertaking an exciting mixed-use commercial and residential development located in South Brisbane’s viable Cordelia Street. The project was settled on May 11th 2015. The site at 1 Cordelia Street will see the re-development of a vacant TAFE into a triple tower development with modern facades. Situated just 1km from the Brisbane CBD, the architecturally designed three-tower complex will consist of two 30-storey buildings and a 13-storey building. It will encompass an impressive 568 apartments (including 248 one bedroom, 225 two bedroom, and 95 three bedroom apartments). It will also comprise of 11 retailers. The site will cover 4,661 sqm and include 678 car spaces to comfortably accommodate for residents. R&F Property Australia is keen to impress the investor’s eye through the development of dual-key apartments, contributing an impressive 91 lots in the mix. These layouts not only provide a great sense of privacy; they also give residents the potential to rent out their private space. “Dual-key apartments allow investors to capitalise on the intelligent configuration and gain a higher rental yield”, stated Vincent Chen, Deputy General Manager for R&F Property Australia. Another distinctive feature of the company’s development are to incorporate a leafy ecological rooftop oasis, giving residents a recreational retreat, and offering a refreshing balance between nature and commerciality. Occupants will be treated to spectacular views; those residents on the Cordelia facing end are given iconic views of the Brisbane CBD and those located on the Boundary Street end will be enjoy the picturesque landscape of Mount Coot-tha Quarry. 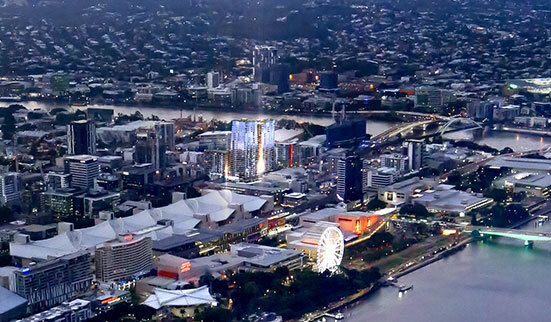 There is access to an abundance of popular amenities in surrounding areas including Brisbane CBD and the Queen Street Shopping Mall, the State Library of Queensland, Southbank Parklands, Queensland Cultural Centre, City Cat river ferry terminal, as well education facilities including Brisbane State High all within walking distance. Adding to its attractiveness, the development puts prospective residents in convenient access to all kinds of transportation, being placed only ten minutes to South Brisbane Railway Station. R&F Property Australia prides itself on the development of properties with superb finishes and visually striking ecological landscapes making this exciting project one to look out for. The yet to be named complex is based in a quality neighbourhood with its modern, innovative design and notable height to give it a prominent place in South Brisbane. Demolition is currently underway and should be complete by the end of July. Expected completion for the project is December 2018.